Did you know that KMS Tools is an authorized 3M dealer? With 100+ skus of 3M products, including respirators, safety glasses, tapes, earmuffs, abrasives and more, KMS Tools has the 3M products you need. Shop the 3M line now or keep reading to learn more about the innovative and useful 3M products available at KMS Tools. 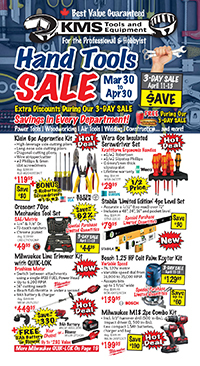 Duct tape, electrical tape, masking tape, packing tape, sheathing tape—KMS Tools has it all. 3M makes a variety of tapes for diverse applications, from sealing boxes to installing housewrap to masking a fender. 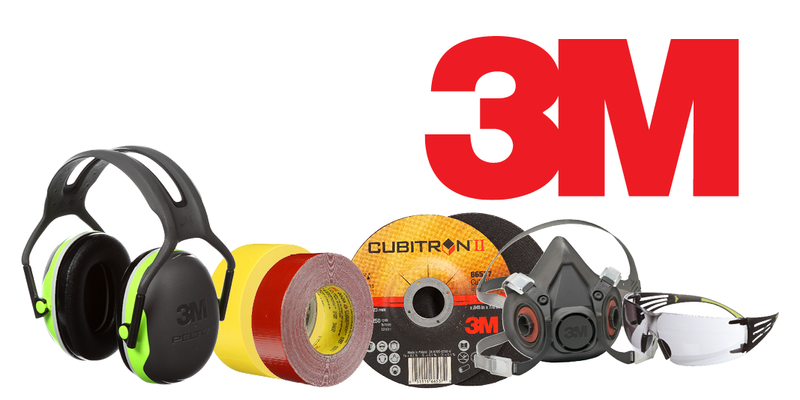 Check out the 3M tapes at kmstools.com and find everything from general-purpose masking and duct tape to specialized tapes for professional autobody and construction applications. While KMS has sold Scotch-Brite surface conditioning discs for years, 3M Cubitron II grinding wheels, cut-off wheels and flap discs are now available in stores or online. These high-quality abrasives provide fast, cool cutting performance through steel, stainless steel, alloys and more. Cubitron II wheels and discs feature 3M’s precision-shaped ceramic grain. This grain lasts longer and requires less force than the company’s previous high-performance grain. Lightweight, comfortable and certified to CSA standards, 3M SecureFit safety glasses meet the eye protection needs of your crew. These glasses feature pressure diffusion temple technology. This improves comfort and also saves you from buying various sizes of protective eyewear. SecureFit safety glasses fit all shapes and sizes of heads, universally. The glasses have no moving parts and self adjust for each wearer. SecureFit glasses weigh less than 1 ounce and are available with different combinations of shades and coatings such as anti-fog, anti-scratch and Scotchgard. Check out the selection of 3M safety glasses at kmstools.com and find the right style and tint for you and your workforce. From full-face respirators, half masks that fit under welding helmets or disposable N95 respirators, KMS has the 3M personal protective equipment you’re looking for. When welding, painting, drilling concrete, sawing lumber or demolishing an old kitchen, protecting your lungs is essential. KMS Tools stocks a full selection of 3M respirators and replacement filter cartridges. It’s the place to find the right respiratory safety equipment for your next project. Available in a variety of styles and colours, 3M Peltor earmuffs provide comfortable, durable and effective jobsite hearing protection. KMS Tools sells Peltor earmuffs with Noise Reduction Ratings (NRR) up to 27, plus models that work with hard hats, welding masks and face shields, including the lightweight and low-profile X4 series. KMS also has both corded and non-corded 3M ear plugs. In addition, KMS carries 3M welding helmets, thread lockers, construction adhesive, autobody polish and more. Stop by kmstools.com today and find the 3M products you need for your project. This entry was posted in Archives, Construction, Safety Supplies, Welding and tagged safety equipment, Welding by Your Friends in the Tool Business. Bookmark the permalink. ← Previous Previous post: Gift Card Giveaway Contest Winner!